I enjoy searching the net looking for ideas and products related to Country and Primitive decor. I like to make things myself.. when I have the time.. so like to check out patterns. These Primitive Easter Eggs are darling in this small basket. The price of the pattern is only $4 and you get her staining recipe as well. Make up several to use around your home in baskets and bowels. Click on the picture or HERE for the site to order. According to the site, this egg pattern kit is a ‘No Sew’ pattern. This might be a good project to do with kids. The eggs are beautiful and the rich colors would be great in any Prim home. An old basket, some grass or straw and these rustic eggs and you have a nice touch for the coming season. Click HERE or on the picture to check out the sellers web site. While you are on this site check out the articles and the rest of the information contained on the site. I have been here before I have gotten a lot of info here. Another very nice site with lots of great patterns. These eggs are very cool and I fell in love with several of the patterns on the site as well. I particularly love the Woolie Sheep.. and am tempted to get that pattern for myself. I just don’t know when I will find the time to make them. Maybe when I get moved later this year I will have a few evenings to myself.. lol.. time to wake up from that dream. 🙂 anyway, click HERE to visit the site and enjoy. I have found another wonderful site to visit.. A Primitive Place. 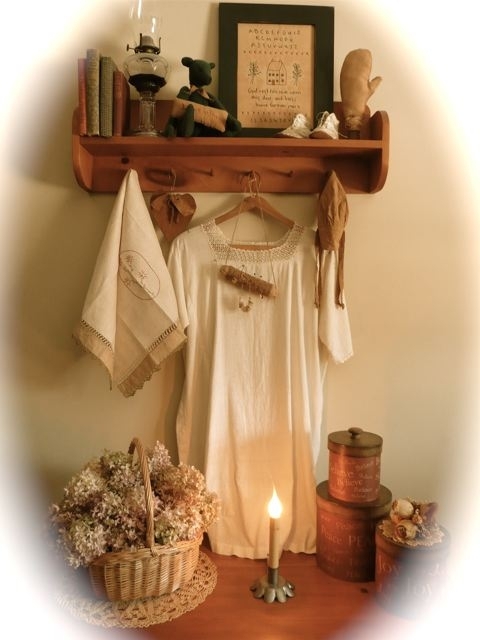 From their site.. “Our site is full of primitive & colonial inspired homes, primitive inspired gardens, decorating and craft ideas, trash to treasure makeovers, monthly crafting tutorials and much more! ” Well worth some time just looking at the great decorating ideas. I especially enjoyed the trash to treasure and craft sections. Also check out their blog. Though it is now past my bedtime.. I can’t stop looking at all the wonderful pictures of decorated homes. I get asked a lot of questions about how to do things around the shop. My experience is candles and scented products. But I have come across others that do a wonderful job of other types of crafts and I also like to cruise the net looking for info to see how others go about doing things. So, although I have not tried these procedures for myself, I have heard and seen the results of others doing them. Primitive decor has a palate of darker colors.. the colors you get over time. Blues and reds become muted, black gets more charcoal and anything white developes an darker antique patina. So, to get that age-old look instantly on fabric, you can tea or coffee stain. Tea staining is the less extreme of the two methods. It will give you lightly stained, yellowish-brown areas on your fabric. Different teas will result in different tints and tones in the final product. Standard black teas will give a soft brown or cream color to your fabric, while some of the herbal teas leave more of a red tone. To create tea dye you will need to bring to boil enough water to soak your fabric in. Then add 1 tea bag to every half a cup of hot water and let it brew for about 10 minutes. Soak the fabric you wish to age in the bucket of tea. Swish it around every so often if you want a smooth textured finish. Leave it without moving it much for a mottled finish. When the fabric has soaked “enough” pull it out and rinse it under cool water. You will loose a lot of the color doing this, so if it isn’t dark enough to suit you, soak it some more. Be aware that when the fabric dries it will be slightly lighter as well. It’s been found a medium light tan color can be achieved after about an hour. A richer tan can be achieved with an overnight soaking. Another method of staining fabrics is to sponge them. Make up the stain as before, then using an old sponge, soak up some of the tea dye and blot it onto the fabric. This gives a distinctive mottled look to your fabric. You could build up layers using different strengths of tea. The more tea dye you use, the darker the stain will be. This process gets the fabric pretty wet. You can lay the fabric out to dry, run a fan over it or bake it in the oven at about 200 degrees for a few minutes to dry it. Reapply additional coats of tea dye as necessary to get the desired color. Tea dye is only for natural fabrics like cotton and linen. Tea dye is also semi-permanent. What this means is that while it will not wash out easily, you can usually remove it with bleach. It may also fade in sunlight. It is not suggested for use on items (such as clothing) that will be washed regularly as modern detergents are designed to remove the tea stain. For a richer and darker color, try coffee dye. A recipe I found was mixing 5 tablespoons of instant coffee crystals in half a cup of hot water. They also added a few drops of vanilla extract to add a bit of scent to the mix. Other recipes throw in a tablespoon of cinnamon for the aroma as well as the texture it gives. To stain with the coffee dye, use the same sponge-blotting method described above for the tea dye. When the piece has the desired color it can then be baked in the oven. You can also spray tea or coffee dye on with a spray bottle, or dry your fabric outside in the sun on a warm day. We are starting to put out our Christmas items that have been arriving the last few months. We have several ornaments and these little guys are not only cute on a tree, they are an adorable way to give a gift card, especially one of ours, to your Country or Primitive loving friends and family. Another Primitive Snowman ornament are these two. They come as a pair and have a wonderful grungy look that will complement any tree, especially the German Twig Trees so popular in Country homes. Even Santa has a nice grungy Prim look with these ornaments. Our Santas are a good size and I can see them hanging in several places around a home as well as your tree. I am looking for unique places for them around the shop and will get some more pictures when I start putting things together. These pictures do not do these little trees justice! Instead of a bright green typically found in Christmas trees, they are a neat olive color and are dusted with a gold glitter that just makes them something you HAVE to have this year. I bought the last three of these and am seriously considering keeping one for myself. They are about 2 to 2 1/2 feet tall and have little pinecones on the branches and are nestled in a primitive finished pot. A close look at the branches and you can barely see the sparkle of the glitter. These trees look fine on their own or add a few small prim ornaments or a small strand of rice lights for even more impact. The last buying trip I picked up a lot of rusty items. Rusty stuff looks so nice with primitive decor. Buying pieces already rusted is one way to get them.. and another way is to rust items yourself. I cruised the net and found some nice recipes for rusting your own items. This recipe I got from Two old Crows and will nicely rust safety pins, jingle bells, or anything else you want to ‘age’ for your primitive creations.The most important thing to remember about rusting, is that you will want to buy the cheap brand of pins, safety pins, bells..etc that you can find. The more expensive brands have a shellac coating on them that you will have to sand off before rusting. Makes sure they are NOT brass either -brass will not rust.Do this outside away from children and pets…..the fumes are terrible ! Combine the ingredients in an old quart jar. Add items you want to rust and cover loosely – place in a safe spot and let set for at least 2 days. Line a tray with a couple of layers of paper towel and remove the items with an old fork from the mixture. place in the sunshine …….the items will begin to rust as they dry. Move them around so that they dry on all sides. Caution: do not throw the mixture down the sink- dispose of properly where no animal or child could come in contact with. And here’s another recipe I found at the Home Decor Ideas blog. Measure 2 cups of CLOROX or any household bleach and pour into a metal cookie sheet with sides. Add l cup of APPLE CIDER vinegar and mix thoroughly. This must be done in a well-ventilated area or outdoors. Use an all-metal cookie sheet with sides. DO NOT use Teflon-coated, enamelware, glass or plastic containers. Immerse tin into solution. Tin has to be completely covered. It will start rusting immediately in the solution. It takes approx. 2-3 min. Lift out of solution and stand on edge to dry. It will become very rusty. Let air dry completely for approx. 1-3 hours or overnight. When it is completely dry, wipe some of the rust off with a dry cloth…this is optional. I found another recipe that is not as toxic at Primitive Folk Art. First, place your items to be rusted into a container that has a lid – She used an empty glass candle jar. Pour enough bleach into the container to cover the items you are rusting, and then put the lid on. Let it sit like this for about 24 hours. Then drain the bleach into the toilet (get a second use out of it as a disinfectant! ), leaving the metal items still damp in the jar. Next cover them with cider vinegar and add in a healthy dose of salt. Cover again, and let sit overnight. Pour the used vinegar down the drain (you can also get a second use of this as a drain unclogger if it follows a dose of baking soda), leaving the damp bells/safety pins/what have you in the jar. Put the jar out in the sun to dry, uncovered, and the metal items in it will rust as they dry. Finding old, timeworn pieces to decorate your home is not easy. Hand hewn wood bowls and trays look so nice in primitive decor. But finding these Treen pieces in good shape takes time and work.. and then paying for them is another matter. So unless you want to become a collector.. what can you do? Treen includes a wide variety of objects mostly associated with tableware, the kitchen, games, personal adornment, and toilet articles. To get that rustic look of the old wood Treen pieces, try our resin reproductions. Molds are made from original Treen so you get every mark from creating to well worn use. Above is a nice shallow tray. I’ve used pieces like that for candles with potpourri or a bit of berry garland or flip the piece on it’s side and use in the back of a hutch to show off another unique item that is place in front of it. The second picture is a pantry bowl. It even has the metal bands like the original. Not shown are some square angled bowls that also have this metal banding. I’ve just started to play with these pieces so we are still discovering ways to display them. We got lots of new things finally out on the floor. I like crocks. I have bought a few old ones at auction with the intention of selling them at the shop.. but I can’t bring myself to part with them. So I pick up interesting pottery when I find it. This jug is really nice. It is hand made and hand painted. These little jugs are awfully cute! Only about 4″ tall, they too are hand made and painted. This style pottery also comes in variouse other jugs and also come nice candle holders. I got a few like this too. This guy has a handle. I also got one that has a a lid and several others in various sizes. these pieces are also hand made and painted so not two are exactly alike. They are very rough and rustic looking. Something else I really like are rusty things. I picked up lots of rusty buckets on my buying trip. They are great around the shop to display things.. but around the house greenery or even a rustic candle and some berries are a nice way to use them.